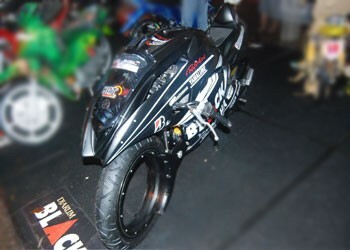 Series of road shows MOTODIFY fifth in 2009 in the city with the nickname of the oil city of Pekanbaru the center of creativity in modifying the focus on the street Cut Nyak Dhien. Gubenur office Dihimpit between Riau and Riau local library, one of the participants who followed the Cipto. Participants from Pekanbaru Mxnya Jupiter is lower with the motor show concept of the future.135 MX Jupter Cipto very character concoction with a futuristic motor and aerodynamic, engine intake did not affect the standard is still use the original engine, just slightly rombakan the exhaust and gas tank custom made so that the value futuristiknya very thick. The most striking of the motor change this futuristic concept is at the very detail ekteriornya assembling motorcycles in the future style. All dismantled but there are some parts that retain their original, doff a black screen with the kind of color from getting sangar Cardillac Jupiter MX made this sketch while adding charm futuristic graphics. Artificial body parts are bent so that the driver was more nuance to the future with a custom designed every detail, to the chain tensioner is made with all beltong intake with the whole concept motorcycle with a custom designed built. The next part of the legs of a cool looking custom made future thinnest sizes so as to appear on the market and Swallow wrapped with tires for the front with 120/17 size rear case bekled Bridgestone 160/17, Cipto also added brake system use Brembo at the front and rear. Another thing that makes this bike to compete following the three categories is with innovations such as starting the system using Keycard designed so that when the automatic sensor system distarter engine running, new breakthroughs are making it more possible Jupiter MX bike is a motor of the future. The owner of the motor, this contest Cipto carrying the flag of his shop with the name Hot Modified.